After Ghaz kills Eldrad, the dies to shuriken fire, the game ends. We tied table quarters, so it goes to kill points. Orks down 9, Eldar down 5 - Eldar win! I'll get him next time. This was a great game. After the Eldar tank drives the grots off the board, the lootas blow it to smithereens with a hail of dakka. The cowardly grots are driven from the table by a well times tank shock. See that seer council? The just squad-wiped 20 stormboyz with template weapons- ouch! In return, the Shoota boyz assaulted and blew up a wave serpent. 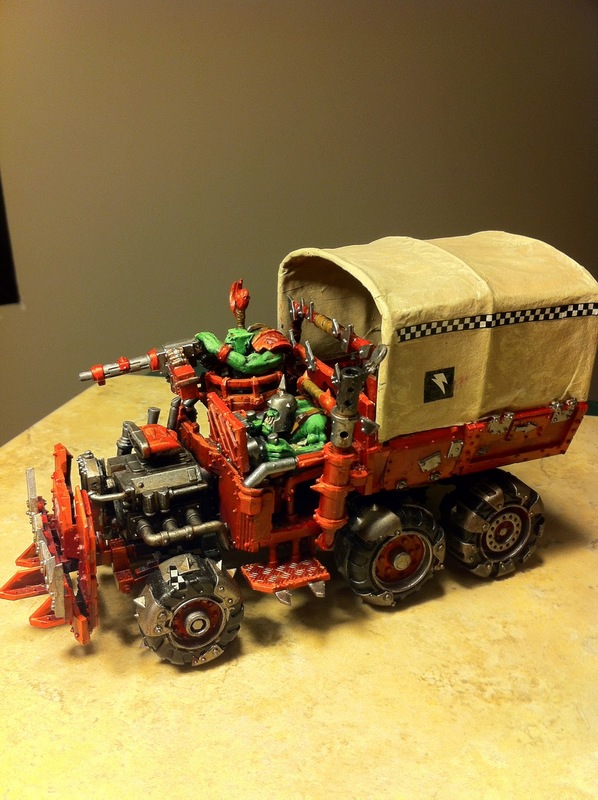 In proper orky fashion, 8 orks died in the resulting explosion. The panzies deployed in a tight formation, effectively bubble wrapping the wave serpents. To top it off, the Eldar seized the initiative! That makes two weeks in a row! Tonight's main event pitted my orks against Bill's Eldar. I rolled high and deployed first. My kopta gunned their engines waiting for a chance to buzzsaw enemy tanks. I recently completed two new Deffkoptas. 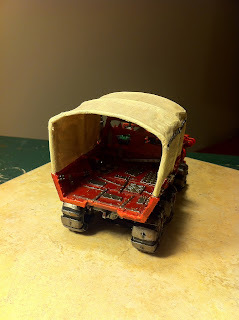 I drilled holes in the front for rare earth magnets so that I can add removable buzzsaws. After taking casualties from stern guard special ammunition, the stormboyz engaged their jumppacks and tore into the marines with a vengeance. Stern guard arrive on my left flak and assault marines pull up all along the opposite board edge. 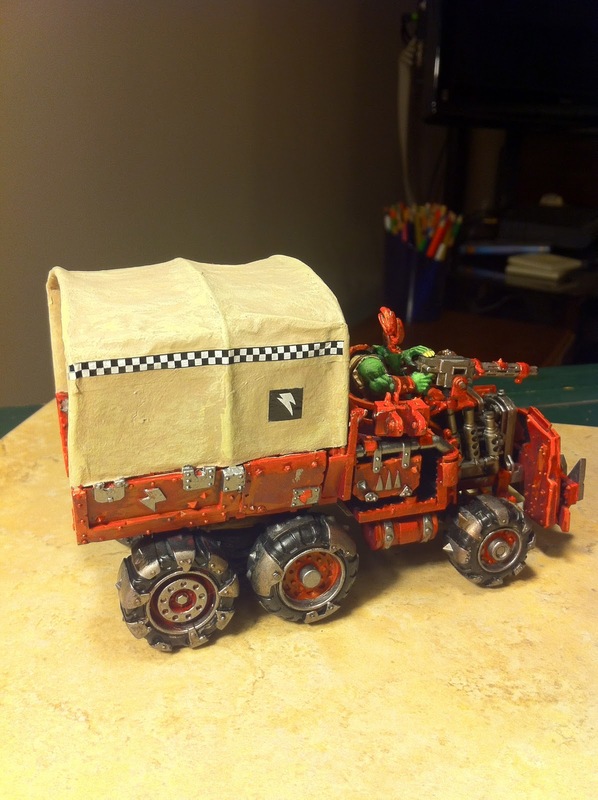 After weathering a torrent of enemy fire from all directions including over 21 wounds from the dev squad, the Trukk was nothing but a debris-strew crater and the nobs mob was at half strength. But... Ghaz was still alive and he was ready to test his power klaw on marine armor. 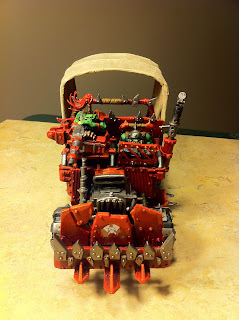 On my turn 2, Ghaz and the nobz mob show up in their hit rod trukk. Wasting no time, they put the pedal to the metal and speeded across the board toward the distant dev squad. On turn two, the blood angel air support arrives and takes aim at the koptas. Lucky saves on my part meant I had one Kopta left in the unit when the guns fell silent, but he was falling back. Who's that over there? Never mind , just shoot em! My first mob of lootas took aim at the distant devastator squad and cut loose. Unfortunately, the bullets all bounced. After losing a few boys to fire from the predator, the Shoota boys advanced on the central objective and the objective located in other quarter on my table edge. The predator was first immobilized by rokkit fire from the shootas, then polished off by a buzzsaw kopter. 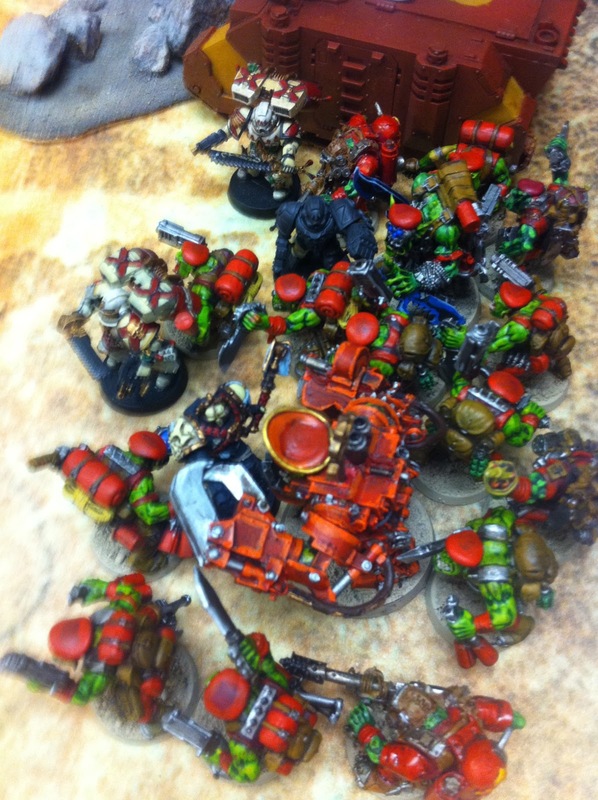 Tonight's main event was 1850 Orks. vs Matt's Blood Angels. This game was the first outing for my storm boys and my nobs mob. Still, I had a good time and I hope to play the DE again. Funny thing about the witches, that darn net makes my deff dread lose an attack! OK, I managed to knock out the DE transports, but the witches inside ended up tying up my Deff dread for the rest of the game. My kannons hit less than 1 time in 3 that game... some cross eyed grots are destined to become ammo for the Shokk Attack Gun. So, I had a chance to play my friend Jordan's DE. Nearly the whole army has FNP, so I knew it would be an uphill struggle.